La Fortaleza and San Juan Historic Site in Puerto Rico played a strategic role at the beginning of the Spanish colonization. This long military history can be found in the defensive system. La Fortaleza is the most prominent of the many fortresses, founded between 1530-1540. 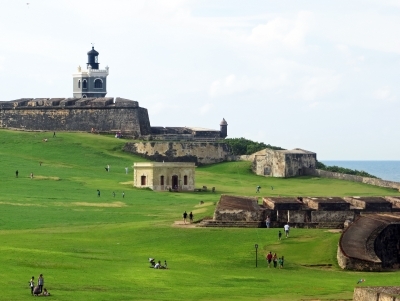 San Juan National Historic Site includes forts San Cristóbal, San Felipe del Morro, and San Juan de la Cruz also called El Cañuelo, plus bastions, powder houses, and three fourths of the city wall. I'm glad I visited La Fortaleza and San Juan Historic Site in Puerto Rico when I did in the fall of 2016, since I learned how beautiful and atmospheric Old San Juan is. This historic city is one of two Spanish built World Heritage Sites in the United States, and includes forts on either end of Old San Juan, most of the city walls, and La Fortaleza, home to the governor of the island. I didn't get to tour the palace, but I did visit both Castillo San Cristóbal, the fort on the east side of Old San Juan, and Castillo San Felipe del Morro (El Morro), the fort on the west side of town at the entrance to San Juan Bay. San Cristóbal offered great views of the city, and was laced with tunnels and batteries to explore. Across town, El Morro's prominent position atop a hill, with the Caribbean crashing into the rocks below, helped contextualize its defensive importance. The walls of both forts were lined with the guard post towers, known as garitas, for which San Juan is famous. The US National Park Service offers informative historical programs at both forts, and I highly encourage a visit. This is particularly relevant now, since Puerto Rico can use as much tourism as possible to help its people recuperate in the aftermath of 2017's devastating Hurricane Maria. Logistics: La Fortaleza and San Juan Historic Site can be explored on foot, although warning must be given that Old San Juan is rather hilly; a recommended scenic (though cat-ridden) path around the west end of the island provides a good view of the walls from the old gate of the city to the base of El Morro. Founded in 1521, San Juan is the second-oldest European city still existing in the Americas, only a few years behind Santo Domingo. It soon became important as the first port of call for Spanish ships en route to the New World, and was therefore a popular target for the English (including Francis Drake), French, and Dutch, as well as for pirates of all kinds. To secure the port, the Spanish built 2 massive fortifications and a large city wall. These form the San Juan National Historic Site, a unit of the U.S. National Park Service. The fortress of San Cristóbal is the largest fortification built by the Spanish in the New World. 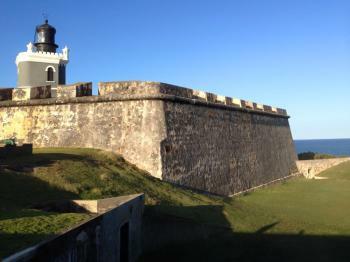 About a 20-minute walk away, San Felipe del Morro guards the entrance to San Juan Bay. The most fascinating feature of this fort is the large open space in front, which was intended to give the defenders an open field of fire. You can easily spend several hours exploring each of the forts. 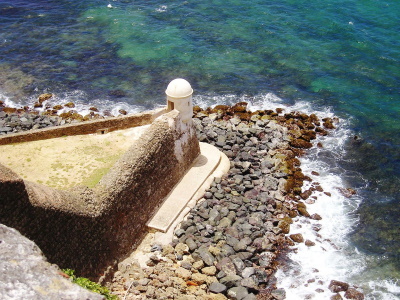 They are connected by the remains of the city wall, which also stretches south of El Morro to include San Juan Gate, for centuries the only way to enter the city. The WH site also includes La Fortaleza, built in the 16th century as yet another fortification but soon found to be inadequate for this purpose and turned into the residence of the governor of Puerto Rico (it is also known as Santa Catalina Palace). It still fulfills this function today, and is thus the oldest executive residence still in use in the New World. Today it is not very difficult to visit; you just show up and register for the next guided tour. I actually had a tour guide completely to myself, and for all of the 30 or so minutes that I was shown around La Fortaleza, a security agent discreetly accompanied us. The inside is quite interesting, but the highlights of this WH site are definitely the 2 fortresses. San Juan is in general a pleasant city, and the historic centre, known as Old San Juan, is at all times full of tourists from the many cruiseships lying at anchor. The fortress is the best Spanish fortress of its kind we have ever seen. It is enormous and visitors can wander at will. There are guided tours which can give you the whole story and interesting details about the history of the fort. The adjacent area is also worth a walk around. There are old churches, historic homes, monuments, and a promenade along the city side of the hill where the fort lies. To me, this Bastion at the heart of San Juan is what the Caribbean is all about. Take away the cruise ships and high rises, and what you have is an authentic relic from the once mighty Spanish Main, a classic icon from a romantic era of exploration and expansion. From "La Fortaleza and San Juan Historic Site in Puerto Rico" to "La Fortaleza and San Juan National Historic Site in Puerto Rico"
Built or owned by Dutch: Dutch owned from Sep. 1625 - 2 Nov. 1625 abandoned. The Dutch occupied only the town and the fort of Canuela in the bay entrance. The fort of Canuela is retaken by the Spanish after three weeks.